Provide additional power outlets along with reliable surge protection. This Defiant surge protector offers a 1000-joule rating and provides complete protection from power surges, spikes, and AC contamination. Its 6 outlets make it ideal for household use. Surge protector with 8 sliding cover outlets, 3 adapter spaced outlet to fit large plugs, 3150 joules of surge protection, grounded and protected LED lights to ensure protection, Coaxial cable connectors for added protection to cable and satellite lines, Combo ethernet/fax ports as added protection for for phone and data lines, EMI/RFI power filtration, Low-profile, right-angle plug fits in tight spaces, and a 6' power cord puts power where you need it. The CE TECH HDC300WUWH Surge Protector is ideal for Home/Office and users that travel and comes with 918 joules of protection and flip out plug for easy storage. 2 USB charging ports charge your personal electronics, including smart phones, cellular phones, MP3 players, digital cameras, and other devices. 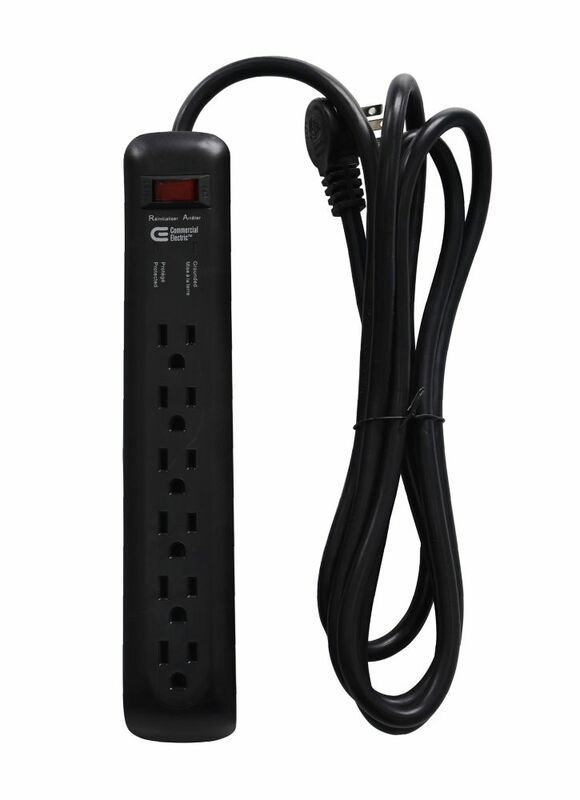 The surge protector is ideal for protecting personal computers, printers, and personal electronics that can require AC power. 8 ft. 45 Degree Angle Flat Plug 6-Outlet Surge Extension Cord in Black Provide additional power outlets along with reliable surge protection. This Defiant surge protector offers a 1000-joule rating and provides complete protection from power surges, spikes, and AC contamination. Its 6 outlets make it ideal for household use. 8 ft. 45 Degree Angle Flat Plug 6-Outlet Surge Extension Cord in Black is rated 4.3 out of 5 by 31. Rated 5 out of 5 by Dees from It is doing what it should. It is doing what it should. Rated 5 out of 5 by Teacher from It works great.... It works great. Rated 3 out of 5 by TM from The plug wasn’t as flat as some of the others... The plug wasn’t as flat as some of the others I’ve seen and I needed it to be as flat as possible. When I went to pick it up after ordering it online, I immediately returned it and ordered a different one on another site instead. Rated 4 out of 5 by HomeDepotCustomer from Does the job and the 8' cord was just what... Does the job and the 8' cord was just what I needed!